When I heard that Glitter Gal polishes had made it across to the UK last month, I immediately skipped over to the UK stockist and placed an order for the two polishes that I’d been wanting for a while. I first tried a Glitter Gal polish a couple of years back, and very pretty it was too – since then, the line has expanded greatly and my heart was going pitter-patter for their holographic RED… but more on that one another time (i.e. when I’ve done the photos). 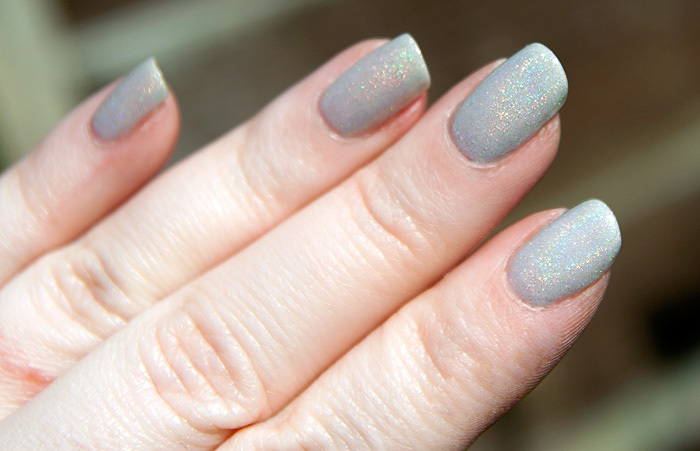 Light As A Feather is a subdued holo which compliments the soft, ethereal shade beautifully. It looks plumpity and squishy on the nails with a little visible nail line peeping through despite three coats. I think it actually suits the calm demeanor of this shade to be a little sheerer. Sure, it’s not a wham-bam in your face holo but it feels like a demure, more grown up version of the trend – ideal for those of us looking for a work-appropriate bit of sparkle. Once the light hits it (please excuse my dry hands and nails), the holographic particles spring forth and dance a little jig on your fingertips. They’re linear in placement and sparkle rather than dazzle with their prettiness. Jenni has a great swatch of it here. That Is Gorgeous! I Don’t Usually Like Thhat Many Holo Polishes (After My Experience With GOSH’s Holo The Chipping Was Dreadful!) But I May Just Make An Exception For This, Understated But Gorgeous Nontheless! Just received my order. They’re very pretty, but the bottles are tiny! Can’t see how they contain 9 ml each?! I’d get me scales out (they measure mls, lbs, oz, the lot) but I fear I’d never get the polish back in the bottle! I’m sure it’s all there, just the bottles seem so tiny. Maybe they have thin walls though, sometimes they can be so big with not much inside. However, the colours are gorgeous, I can’t wait to try them out, don’t even know which one to pick first! What a stunner. Gee whizz. Thank you for mentioning us in your post, Light as a feather is one of my personal favourite’s, your nail’s look lovely!